Get ready to don your pith helmet, pull up your khakis, and slap on your hiking boots ... but you can leave your binoculars at home. That's because when you head on over to the Red Brick Gallery (http://redbrickart.com) now through July 11th, you'll be able to get up-close-and-personal with my very own untamed mobile herd. 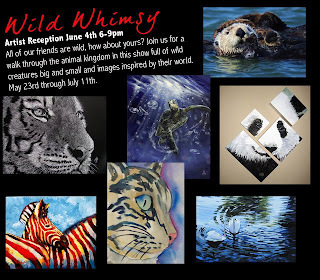 This is your chance to take an urban safari and watch as these ethereal air beasts effortlessly mingle-spin with a whole gaggle of other great artists at this month's Wild Whimsy show. Beginning this Thursday and running through July 11th, this show lets you take a walk on the wild side with all things a-n-i-m-a-l! A good time is guaranteed for all as Phyllis Gubins and Jennifer Livia always put on the fantastic fun.